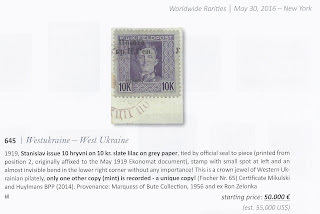 Trevor Pateman's Philately Blog: The Crown Jewel of Western Ukraine Philately? The famous stamp shown above was unsold in the Christoph Gaertner Rarities auction in New York on 30 May 2016. 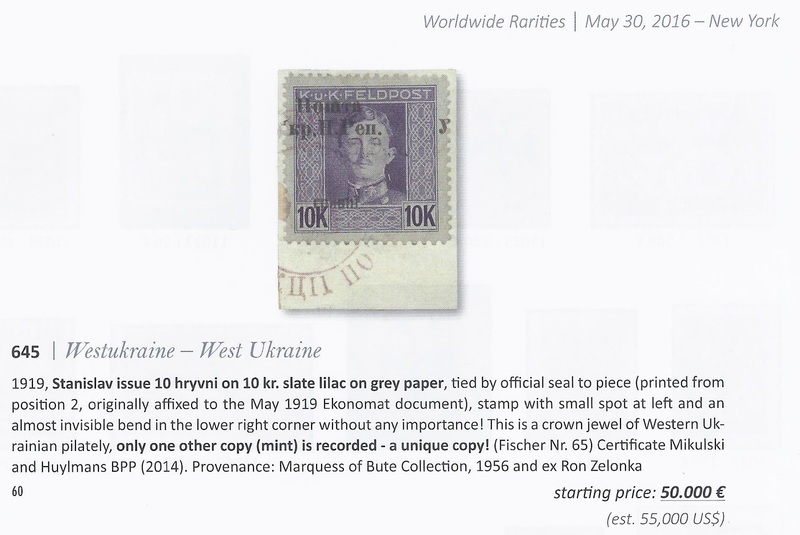 It's described in the catalogue as the "crown jewel of Western Ukrainian philately" - and I used the same words when I wrote the descriptions for the Ron Zelonka sale at Corinphila Zurich in 2011. There the stamp was started at 30 000 CHF and sold for 44 000, which meant a final bill to the buyer of 52 800. So the Gaertner start price looks as if the 2011 buyer was prepared to sell with a chance of doing no better than getting their money back. Personally, I think it's an over-rated stamp. The stamp issues of the Western Ukraine National Republic in 1919 all had strong philatelic motivations and little genuine postal use. This combination of stamp and overprint, in an edition of two, was entirely speculative - it was made so that someone or some group could benefit in some way. It must have added significantly to the value of the Ekonomat document to which it was originally affixed, even before its "Crown Jewel" status was given to it.. In contrast, scarce and rare non-philatelic mail used in the Republic during 1919 is bought and sold for only a fraction of the price expected for this stamp. For example, in the Zelonka sale I described a lot of 37 mostly non-philatelic covers as a "valuable lot" and attached a start price of 3 500 CHF - 100 CHF per cover. It sold for 11 000 hammer, but that still works out at only 400 CHF per cover. But if you started out today to accumulate 37 non-philatelic covers from 1919 Western Ukraine, not in the Zelonka lot, you would I think be lucky to achieve your goal. True, most of the covers in the 11 000 lot were franked with unoverprinted Austrian adhesives - but that is what you would expect. The overprinted stamps were made principally for dealers in Vienna, not for local mail. The exceptions are the Registration and CMT stamps of Kolomya and that for the rather strange reason that the philatelist involved in the issue, Cerniavski, liked to collect ordinary commercial mail - at the time, a fairly eccentric choice. Since he worked in the local court in Kolomya, he simply collected the envelopes coming into the court from all over the district of Kolomya / Pokutia - and very interesting envelopes they were!